Currency manipulation is a big deal. It is costing up to 5.8 million American jobs and costs U.S. GDP by up to $720 billion. 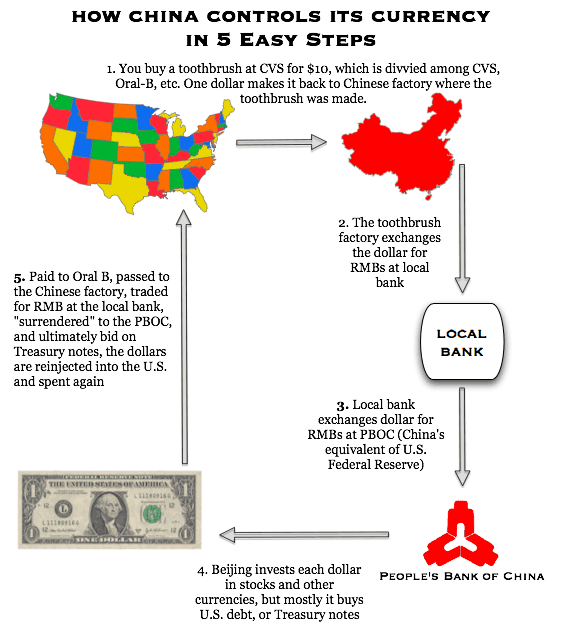 So what is currency manipulation and how does it work? A currency is the local “medium” of exchange. Different countries use different currencies, so to trade there has to be a way to set the exchange rate of the currencies relative to each other. The relative value of things can be different in different countries, and this can fluctuate. Maybe there is a lot of gold or corn or wood or clocks here this year here and a scarcity there … so the exchange rate of the currencies used to trade all of these things is (or should be) constantly changing. When a country is selling more stuff to the world than it is buying (a trade surplus) the price of its currency is supposed to go up. People and businesses are buying the currency of that country to get the things from that country, which increases demand for that currency. Increase in demand for something pushes its market price up. A currency is said to be “strong” when its price is up, and it can buy more things. 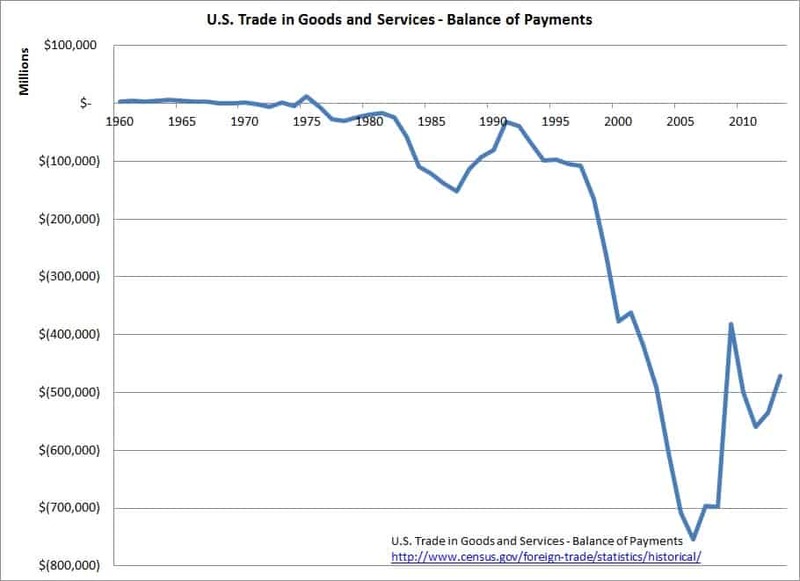 Similarly a trade deficit should push the value of the currency down. When you are buying more from the world than you are selling to the world, you are flooding the world with your own currency. So world demand for your currency is low, which should push the price down. A currency is said to be “weak” when its price is down, and it can buy fewer things. This is all supposed to be self-correcting. It is supposed to adjust and balance out through markets. Countries have surpluses and deficits of goods or money in a given year. The currencies of countries with a trade surplus – selling more than they buy – get stronger. So it costs more to buy from them and it costs them less to buy from others, and in following years their trade surplus goes down – they start to buy more and sell less. The currencies of countries with trade deficits – buying more than they sell – get weaker. So it costs less to buy from them and they can’t buy as much from others, so their trade deficit fades. When currency exchange markets work correctly and the exchange rate is set by whatever lots of people want to pay to change one currency into another at a given time, the world’s trade theoretically balances out. Imagine this scenario: A country is selling more than it is buying and has a trade surplus. If markets are working correctly, its currency would become “strong” because the world is buying its currency to buy its stuff, so its goods would start to cost more. Meanwhile, its stronger currency would enable people and businesses in that trade-surplus county to buy more from the rest of the world. So over time the country should sell less and buy more, bringing its trade back into balance. But suppose that instead of lots of people and businesses in the trade-surplus country using the stronger currency to buy more stuff from the rest of the world, that country instead has a central authority that uses the surplus of incoming cash to buy the currency of other countries. This is called currency manipulation. It bypasses the natural market supply/demand function of the currency exchanges. By doing this the country that has been selling more than it is buying is able to keep the demand and therefore the price of other currencies up, meaning goods from those countries still cost more and goods from its own country still cost less. That country’s trade surplus continues upward instead of adjusting. Factories in other countries close, people in other countries lose their jobs and the wealth of nations shifts to the currency-manipulating country. There are advantages to various interests if they can keep exchange rates high or low. Someone holding on to a lot of cash might want the value of their currency to become and stay “strong” so they can go out into the world and buy more things. But someone who makes something might want the value of their local currency to become and stay “weak” so the price of what they are selling is more competitive elsewhere. In other words, investors want their country’s currency to be strong at any given time and manufacturers want their country’s currency to be weak at any given time. Inside of every country and every system there are competing interests. When markets are not transparent and are instead corrupt and manipulable, the beneficiaries of the manipulation naturally use the advantage they gain to further manipulate the process. Currently in the countries that are manipulating currency – and in those not confronting and stopping that manipulation – the interests of those who benefit from the manipulation are winning. Currency manipulation is a major factor that has caused our country to have a continuing (non-adjusting) trade deficit. This trade deficit is a metric with which to measure jobs, factories and entire industries leaving the country, thereby lowering the standard of living of approximately 99 percent of us while benefiting an already-wealthy few. Currency should fluctuate. China’s economic strength and trade surplus should mean the value of the yuan rises a few percent here and there aside from the market adjustments others are requesting. In other words, as long as China has a trade surplus the yuan is out of adjustment. So when you hear about the yuan rising a few percent, remember that this is from a manipulated base, not the normal market fluctuation we should be seeing. At a time when many were writing that China has been allowing its currency to rise, Robert Scott of EPI wrote, “China invested more than half a trillion dollars in purchasing foreign exchange reserves in 2013 alone—a new record. But for those purchases, the value of the RMB would have been significantly higher.” As to the normal fluctuation we should be seeing, “China must allow its currency to rise by four to seven percent a year simply to keep its trade surplus from expanding.” Again, that’s a rise of four to seven percent to keep it from expanding, never mind getting rid of it. So countries like China approach trade as nations instead of as a unit of individuals and businesses that happen to reside inside a common border doing whatever they want. These countries do what they need to do to advance what is considered to be a national interest at a given time. Right now China and several other countries believe it is in their country’s interest as a country to run a huge trade surplus with the world, which brings in cash, jobs, factories and industries at the expense of the rest of the world. So acting as a country, they buy up dollars and other currencies to force up demand and cause those currencies to have a higher, “stronger” price than their own currency. Meanwhile the United States does not see itself as a country when it comes to trade, and does not see itself as having a national interest. It’s against the current dominant ideology to act as a country or to have – any – particular national interest when it comes to trade. So we do not as a country confront other countries even when those countries act in ways that confront us as a country. We do not have a national economic policy. We do not respond when countries manipulate their currencies to drive our currency up in price. We send our businesses out alone to compete in the world – against countries. We don’t even do anything about it if those companies decide to become companies of other countries! The result is we end up having a massive, enormous, humongous trade deficit that drains us as a country of jobs, factories, entire industries and our national wealth and standard of living.